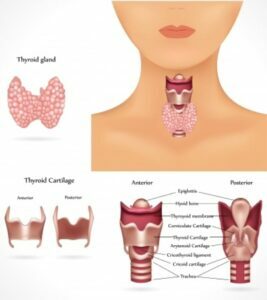 Hypothyroidism occurs when the thyroid gland does not produce enough thyroid hormones with the most common cause being iodine deficiency. The list of symptoms as a result of hypothyroidism is extensive but includes tiredness, weight gain, dry skin, outer one third of eye brow loss, sensitivity to feeling the cold, infertility and low libido, depression and carpal tunnel. Western medical treatment is the administration of synthetic thyroxine. Severe hypothyroidism can result in goiter. Traditional Chinese medicine physicians realized the connection between goiter and iodine over a thousand years ago. They didn’t call it iodine though, but ancient Chinese physicians worked out that certain foods such as sea weed treated and prevented goiter. Western medical physician only worked this out in the early 1800’s. Unfortunately, hypothyroidism is now over diagnosed and is being over treated. Researchers from the Cardiff School of Medicine have found that hypothyroidism is being aggressively treated when it is not actually required. One of the researchers commented that “This practise may be harmful, given the high risk of developing a suppressed thyrotropin level after treatment.” Dr Wartofsky of the Washington Hospital Medical Center said that over treatment carries risks. How does Chinese medicine look at hypothyroidism? Chinese medicine treats hypothyroidism from quite a different angle. Symptoms like lethargy, feeling cold and low libido come under a traditional diagnostic classification called yang deficiency. The goiter itself is classified as a phlegm nodule. Acupuncture treatment is aimed to strengthen the yang. Explaining yin and yang in modern medical terms is difficult but the yang can be compared to the adrenals which “fire” up the body. Chinese physicians aim to warm up the coldness experienced by hypothyroid patients and often use moxibustion. The coldness that hypothyroid patients experience originates in the low back and kidneys which then influence the thyroid. Other acupuncture points have the traditional function of dissolving phlegm and have specific indications to treat goiter. Acupuncture and Chinese herbs for goiter and the associated symptoms of hypothyroidism have been used for centuries in China. Heiko Lade manages the The Acupuncture Clinic – Hastings and John Kennedy manages The Acupuncture Clinic – Masterton.